This is perfectly new style watch in the family of Seiko Watch. It is full of functionality and full of style. The case of this Seiko Alarm Chronograph Watch is made up of Stainless steel case and is well suited with brown leather strap. The strap color is very attractive. It is comfortable and easily adjustable over any wrist. The White Dial is very impressive and easy to read. The hands and marker in this watch are having luminous material which makes this watch readable in dark places. There is a rotating bezel over the case. The Hardlex crystal is used over the beautiful dial for better protection and clear view. 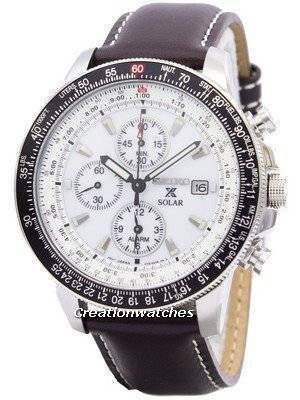 The specialty of this Seiko Chronograph is the Quartz Movement which works on solar energy. Here you don’t need to change a battery and you can enjoy the great features of Alarm chronograph. The water resistant of Chronograph Seiko Watch watch is 100 meters which allows you to wear this watch is swimming pool. Moreover the Screwed Caseback makes this watch safer from dust and moisture. You can note the current date on the small window near 3 hours position. The chronograph of this watch is with 1/5 seconds up to 60 minutes. You can note the dual time with this watch. The dimension of this watch is very suitable for men’s wear. The case diameter of this watch is 42.5 mm excluding crown. The weight of this watch is 82 gm. Overall this watch has elegant design and chronograph feature. This Seiko Alarm Chronograph has genuine quartz movement, and like most of the Seiko line is very dashing. Now, admittedly, not many of us are pilots – either leisure or commercial. But that shouldn’t stop us from liking Pilot watches? The Prospex Sky Solar Chronograph Blue Dial has some great features from the solar powered quartz movement, great looking blue dial all the way down to the attractive bracelet. On top of those great features, don t forget the solid lume and applied hour markers providing a level of detail not always found on watches in this price category.